Our saltimbocca recipe is a simple, delicious, authentic Italian dish. This pork saltimbocca recipe is as delicious when made with turkey to add to your special Italian Thanksgiving or Christmas recipes. And saltimbocca is spectacular when cooked at the table! loosely translated, means ‘leaps in the mouth’ - and it does. This particular recipe - ‘saltimbocca di maiale’ is made with pork, but a saltimbocca recipe can be made with more or less any meat. Veal makes it a typically Roman dish, while chicken or turkey turns it into one of the more popular of alternative Italian Christmas recipes. The ingredients are simple but the flavours are amazing. As with any Italian recipe, try to use the freshest ingredients you possibly can - it does make a big difference. These quantities make enough for a main course for four people, or can be cut into bite-sized pieces for a tasty appetizer. ✮ Cut any excess fat off the meat and wrap it in cling film (Saran wrap). ✮ Beat it with a meat hammer or rolling pin until it’s very thin - about half a centimetre thick. This tenderises the meat and also allows it to absorb more of the delicious flavours during cooking. ✮ Divide the sage between the pieces of meat, laying them on top. Use fresh sage and don’t cut the leaves up - they’re more flavourful whole. ✮ Now lay one piece of Parma ham per fillet on top of the sage. ✮ Use a toothpick to pin the layers together; this makes sure all the flavours mingle during cooking. ✮ Put half the butter and a dash of olive oil into a frying pan : the oil will prevent the butter from burning. ✮ Make sure the heat is quite high so the meat cooks quickly and retains the moisture - otherwise it will become hard and dry. ✮ Put the meat into the pan with the Parma ham side facing down (so it’s in the oil). ✮ Turn the meat over after just a few seconds. ✮ Drain a small amount of the fat in the frying pan into a bowl, then return the pan (including the meat) to the heat. ✮ Put the Marsala wine into the pan - it’s at this point it will flame. ✮ Simmer for two minutes to burn off the alcohol in the wine and allow the sweetness to come through and flavour the meat. ✮ Add a knob of butter, allow it to melt, season with a dash of salt and pepper if you want to (but be careful not to overpower the other flavours) and then take the meat out of the pan and leave on a plate to rest which will tenderise it still more. ✮ Return the pan to the heat, add the remainder of the butter and stir well for several minutes, using a wooden spoon, making sure all the juices combine and scraping up all the bits of meat from the bottom of the pan. 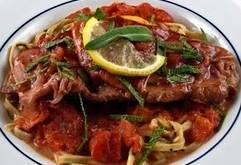 ✮ Return the meat to the pan for about thirty seconds, spooning the juices over the meat. ✮ Arrange the meat on plates, remembering to remove the wooden toothpicks. 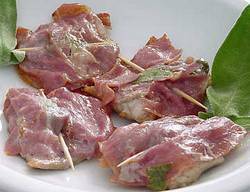 ✮ Drizzle a little juice over each piece of meat - not too much or you’ll mask the taste of the ham. Serve with a simple green salad and have a look at our homemade Italian salad dressing recipe to accompany it. Like another classic meat dish? Here’s the best recipe for Italian meatballs we know! This saltimbocca recipe is a rich dish and doesn’t need a lot of accompaniment. But if you’d like an equally rich Italian salad recipe to go with it, this Caprese salad adds a cheesy tang.